I recently had the pleasure of doing an interview of Marker Jones, head of United Sight Studios for the upcoming digital convention, AetherCon. Marker is the creative force behind the recently released Worlds of Rage RPG. He has worked as both a game designer and writer for the game which includes an original skill-based system and a unique science fiction setting. In the summer of 1991, my high school friend bought a board game called Hero Quest. It was so far from the family-favorite Monopoly that I was hooked. We heard of a local gaming group starting that December. We mistakenly thought it meant board games. We went there to check it, found out about D&D, Rifts and Marvel Superheroes, and the course of my life changed forever. Which came first with Worlds of Rage, the setting or the system? The system for WoR was probably the 14th one I tested. Originally the system used every die you can imagine. After clunking through one rough combat after another, I ended up streamlining it to the current system. Surprisingly, the system as stands came to me at a gas station. I was waiting in line to pay for my gas and noticed this station sold six-sided dice. We had recently had a gaming store close in town and people were wondering where they were going to buy their dice from. When I got thinking about how readily available six-sided dice were, everything fell into place from there. What was your biggest obstacle in going from concept to print? Absolutely artwork! It took me seven years to find an artist. I had been to local establishments that do custom artwork and was turned down. I went to the art department at the local university and found no interest. I had to turn to online freelance boards before I found someone willing to help me out. That artist’s prices increased when it came to the cover. A friend and playtester of mine introduced me to his tattoo artist and she jumped at the chance to do the cover. What media (books, movies, comics, etc.) were an influence on the setting? I am a HUGE fan of Frank Herbert’s DUNE series. If anything, that inspired me incredibly. I am also a big science and sci-fi fanatic, so this led to inspiration from classic Star Trek episodes, Battlestar Galactica, Outer Limits, etc. Being a fan of what is known as “hard sci-fi,” I also got some inspiration from actual science and history. How does the system in World of Rage stand out from other games? To me, and admittedly by design, “WoR” is far simpler than most games out there. Everyone is familiar with D&D, but it is really one of the more complicated systems available, what with multiclassing, talents, feats, level progression, challenge ratings, attack bonuses, armor class, etc. “WoR” is sweet, simple and to the point. The game is skill based meaning most any action your character attempts falls back on one of his or her skills. Combat and standard task resolution are all skill checks, there is no other secondary system to learn as there is with other games, even independent ones. Everything is designed to happen with minimal die rolling. The attack roll determines if you hit, where you hit and how hard you hit; yes, when playing “WoR” you are rolling attack and damage at the same time. “WoR” doesn’t have a system of hit points per se, but the character sheet lists how much damage each individual part of your body can take. If one part of the body takes too much damage, skills involving that part of the body increase in difficulty by the amount of damage that body part has taken. If a body part is shut down due to damage, skills involving that part of the body cannot be attempted. What aspects of current or old RPG trends did you find yourself wanting to bring into Worlds of Rage? Some of the more narrative aspects of 13th Age I think are wonderful. I love the concept of plot points from Cortex games. I am a complete fan of the way Marvel Heroic lets players spend XP into the story rather than into their characters. If I ever get to do a second edition of WoR, expect some form of point mechanic that lets players buy into the story more than what we have now. Are there any plans for additional settings using this system? Those plans are already under way. During playtesting, some of the testers enjoyed the system so much that they came to me and pitched their own ideas for games asking if they could use the Stage Level system, as I am calling it. These talks are still under way. I am not free to mention any names yet, but I am currently looking at acquiring a minimum of three titles onto the system. 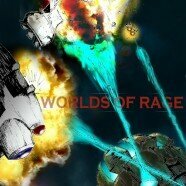 Besides Aethercon, are there any upcoming conventions or events where readers could get a chance to play Worlds of Rage? The weekend following Aethercon, in fact. The Kansas City RPG Guild will be having their annual gaming convention at the KC Airport Hilton. United Sight has a dealer’s table and we will be running demos of the game all weekend, run by myself, some playtesters, and even some of the ones pitching games to us (although none of those in pitch phase will be demoed that weekend, sorry). I also run demos and campaigns on Roll20.net, Infrno.net, Google Hangouts, etc. Look me up on virtual table tops as Firepart Creature. What can we look forward to seeing from United Sight Studios in the future? We have already begun work on the first of two supplements for “WoR.” After that, further supplements will be determined based on response from the community. 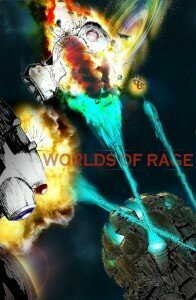 We are also moving forward with a fiction line set in the “WoR” universe to give more depth and detail to how we see the worlds, and to illustrate certain events in the story’s past, such as the Limthrakk Civil War. Beyond that, I have put out feelers to different independent writers about creating original settings in the “WoR” universe. There are other ideas that involve other companies, and I will announce those when deals are finalized. Do you have any advice to share for beginning game designers trying to bring their games out? I found I benefited from having a group in the latter part of the process, combing through the books to find things I had overlooked or hadn’t considered yet. I already had the basic concept and all necessary writing and graphic design skills to begin the groundwork, but games are a community affair (refer to the above passage about my need for artwork to demonstrate this). I used community connections as well as the local university for artists, proofreaders, playtesters, etc. When the community failed me, I took my search online. That never failed me. The advantage to designers now is that we have print on demand and pdf services. You don’t even need to worry about a publishing house anymore, you can just get your book published as a pdf with your home computer, make it available in an online form, use the online market to get the word out (social media, reddit, etc) and word will spread that way. Absolutely do conventions. There is no better way to meet people, introduce yourself and get word out of your game then at a convention. Whether online or in person doesn’t matter, just get the word out. Look into other methods of marketing your book. “WoR” is incorporating ideas such as T-shirts, posters, etc to get the word out. I have found since I started this book that game designers are some of the most approachable people you will ever meet. I attended conventions where professional game designers were making appearances and approached, introduced myself and my product, and every one of them met me as an equal and showed interest. It was an amazing level of acceptance. So make connections, learn your craft, and do what you love. We’re all out here waiting to play your games. For anyone interested, in addition to Marker Jones and Worlds of Rage, there will be plenty more interviews and other gaming related awesomeness at AetherCon, this upcoming November 14th-16th.